The Elizabethtown Area Regional Authority is a multi-municipal authority comprised of representatives from three municipalities in Lancaster County - Elizabethtown Borough, Mount Joy Township, and West Donegal Township. As part of their regionalization study, the Authority received a PA DEP Regional Water Resources Grant to purchase computer hardware and software. Hanover Engineering was retained by the Authority to prepare comprehensive, GISbased mapping of the Regional Authority’s water facilities in the three associated municipalities. Staff members also assisted the Authority in specifying and acquiring both the computer hardware and software purchased through the State grant. 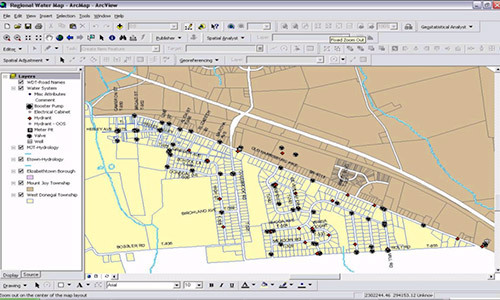 Hanover Engineering translated the existing plans and GIS-based mapping for the water systems, located in the three municipalities, into the computer database for use by the Authority staff. Using Global Positioning Systems (GPS) equipment, additional water system facilities, such as water valves and fire hydrants, were field located and added into the GIS database to provided further detailed mapping of the water systems. With this comprehensive mapping and detailed database, Authority personnel are able to keep updated information on the water system for maintenance recordkeeping and implement the automated scheduling for preventive maintenance of equipment and facilities.